"Levy?" I stared at her again. She simply smiled sweetly. "It&apos;s been a long ten years hasn&apos;t it? I&apos;m glad to see your doing well." My brain wouldn&apos;t quite work. It took an elbow from Grey to snap me out of it. "Uh yeah. You look good too." I said gruffly. She smiled again before leaving the room, my eyes beer leaving her. Why did I feel so weird? She was just a doll my father made... Right? I mentally slapped myself. I hated thinking of them as just dolls. Once Siegrain animated them they were people. Well that&apos;s how I see them anyway. I know Siegrain only saw them as mobile tools. The three of us were quiet as we ate. The one called Juvia coming around to fill our drinks very now and then. Mostly Greys though. "Now then," Siegrain said as he finished. "I must admit I have not been completely honest. I didn&apos;t just invite you for a meal." "You want me to do repair work." I said. He blinked before grinning." That&apos;s correct! How did you know?" "It&apos;s that time of year again. You usually have a hand full sent to me to be fixed. Asking me to come here means a very large number, if not all of them, need some kind of work done." The king smiled." Your very bright." Grey made a muffled laugh. I glared at him and he quieted. I sighed. "Very well. You do know it will take a few days right?" He nodded. "And if you require assistance of any kind feel free to call on the puppets." He said. I just nodded.
" I would also like to offer you rooms to stay in while your here. That way you don&apos;t have to continuously walk across town to get here." A thought clicked in my head as I saw Grey speak." Much appreciated your majesty but-" I slapped a hand over his mouth. "We would be honored." I said a Grey shot me a look. "Excellent! Juvia would show out guests to the spare rooms?" The tall blue haired girl bowed as she approached. "Yes sire." she said. She kept flicking her blue eyes at my apprentice. Grey and I stood, bowing before we left the dining hall. "What the was that about Gajeel?" Grey huffed. "It will make the work easier." I muttered. Greys look said he wasn&apos;t buying it. I sighed. "I need to talk to Levy..." Grey was quiet. I looked at Juvia. "I have never seen you so formal, gihee." I grinned. She turned and stuck her tongue out at me. Grey looked at us confused. "Juvia is one of the girls that usually comes with Lucy on trips to the shop. She is very friendly when the kings not around." I explained. "Juvia hasn&apos;t come recently because Lucy hasn&apos;t been at the palace. Juvia is please to meet you Mr.Fubuster." Juvia said to Grey. Grey looked flustered. "Uh just Grey is fine." I snickered at his pink face. Juvia twiddled her fingers as she looked away and I could tell she was flustered too. "This will be your room Mr.F- Grey." se stammered as she opened a door for him. Grey entered and went straight for the bed. I followed Juvia to another door. "And here is your room Gajeel." "Hey Juvia." I said as she turned away. "Yes?" "Why didn&apos;t you tell me Levy was here?" She looked down sadly. "Juvia did not know she was the same Levy... There have been many to go in an out of these halls... Many similar faces... And yet rarely the same person twice... 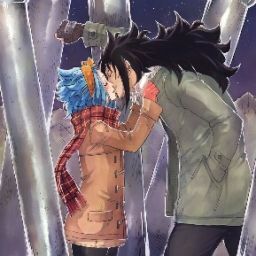 There are a few unique like Juvia and Levy. But I didn&apos;t know. Juvia is sorry." I shook my head. "Don&apos;t worry about it. Can... Can you tell Levy I would like to speak with her in the morning?" Juvia smiled and nodded before going down the hall. I closed the door and turned in for the night.